PeopleSoft (now a division of Oracle) is best known for its Human Resources software. 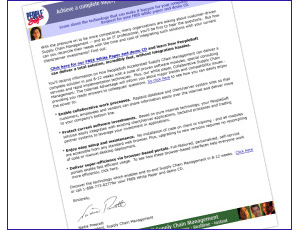 So when Peoplesoft wanted to launch an entirely new Supply Chain Management software solution. They had a lot of convincing to do in the marketplace! PeopleSoft engaged Beasley Direct to produce a series of direct advertising email and direct mail campaigns to educate IT managers on their solution. We emphasized the speed in which a PeopleSoft Supply Chain solution could be implemented. We offered a white paper and demo CD offering case studies on implementations they had done for Fortune 500 companies in less than 12 weeks. This campaign received a double-digit clickthrough rate to download the demo.